In today’s VETgirl online veterinary continuing education blog, VETgirl’s Chief Happiness Officer, Jeannine Moga, MA, MSW, LCSW reviews why we need a more expansive definition of wellness in veterinary medicine. All the chatter about stress, work-life balance, and wellness in veterinary medicine is calling attention to what many have known for years: that a career in veterinary medicine is good work – and hard work – and that we must find a way to take care of our tools if we want a professional life that is healthy, long, and satisfying. The devil is in the details, though – or, more clearly, the devil is in the “how.” How do we create balance when we are working long hours, problems are piling up, and we JUST.CAN’T. GET. AHEAD? How do we find resilience when clients are squawking, colleagues are melting down, and everyone needs more than we have to give? How do we even attend to work when the fabric of our lives (family, friends, finances…) is fraying? While much of the recent conversation reflects the unique difficulties and risks inherent in veterinary medical life, it is equally – if not more – important to focus on what we do to set ourselves up to be buoyant, agile, and strong in the face of chronically stressful day-to-day life. Indeed, research reveals that Americans’ stress levels are high and multifocal, with the future of the nation, money, and work causing significant worry for many of us. So how do we be – and stay – well in every sense of the word? “Wellness” is such a commonplace notion that the richness of its meaning can easily get lost in the shuffle. In fact, we can get a little lazy (and reductionist) when talking about wellness, as if it can be captured by a massage here, an extra few hours of sleep there, and an annual vacation. A closer look, however, reveals that wellness is more complex than most of us recognize. 1. Physical. Physical wellness means taking care of the vessel from which you serve. Not only does this involve meaningful movement (exercise, in other words), but it also requires nourishment, hydration, and ample rest. 2. Emotional. Emotional wellness involves identifying and managing our own emotions, as well as recognizing and respecting others’ emotions. Being able to nurture a generally positive outlook is also related to emotional wellbeing. 3. Environmental. Environmental wellness requires spending time in environments that are safe, stimulating, and pleasant. Environmental wellness also involves the recognition that each of us has an impact on the environments we inhabit. 4. Financial. Financial wellness involves managing resources wisely to meet our needs (immediate, short-, and long-term), as well as living within our means. 5. Social. Social wellness means that we develop supportive and meaningful connections with others and grow a social network that contributes to a sense of belonging. Humans are social creatures, and healthy social relationships are critical to our survival. 6. Spiritual. Spiritual wellness is an expansive process of living each day, at work and at home, in alignment with a sense of purpose and deeply held values. While spiritual wellness may involve engaging in religious practice, doing so is not required to achieve spiritual wellness. 7. Occupational. 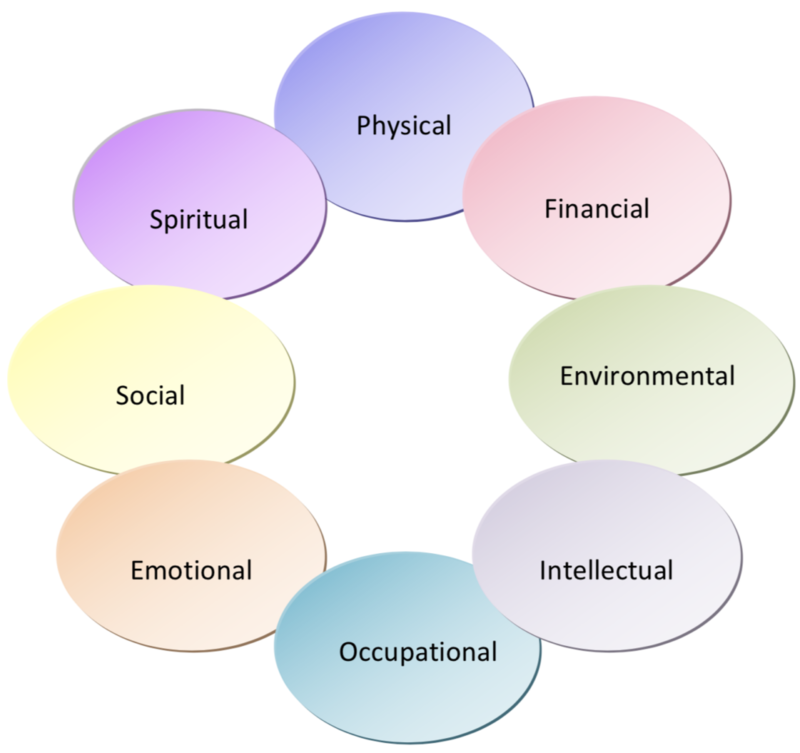 When we pursue work that reflects our values, is aligned with a sense of purpose, and provides us with both a sense of enrichment and satisfaction, we are embodying occupational wellness. 8. Intellectual. Curiosity, learning, and growing both knowledge and skills are hallmarks of intellectual wellness. When we work in environments that stimulate our minds, challenge us to develop our knowledge, and then share that knowledge with others, we can consider ourselves intellectually well. Surprised? Wellness, as defined, may be a bit more complicated than you thought, but engaging in wellness doesn’t have to be. In 2019, VETgirl is going to dive deep into the wellness pool to explore the “hows” that have the greatest potential to enhance your wellbeing and protect your most precious human capital (your own). We will bring you the best of science, distilled to show you evidence-based – and totally reasonable, achievable, and even pleasurable – ways to boost wellness. While wellness does require intention, dedication, and [often] an accountability partner, it doesn’t require a gym membership, deep pockets, or two weeks at a mountain retreat. Not that there’s anything wrong with two weeks at a mountain retreat… but I digress. Come join us as we delve into how to make wellness an everyday reality. It’s possible, even for the busiest of us. 2017 Stress in America Survey, American Psychological Association. Retrieved on 2/8/19 from https://www.apa.org/news/press/releases/2017/11/lowest-point. Substance Abuse & Mental Health Services Administration; see www.samhsa.gov for more details. I keep my home as my sanctuary. My fur kids provide me with love and support, without making to many demands of me. I do have to learn to take better care of myself. Will be reading more. Thank you.